As one who served in Her Majesty’s armed forces for 20 years, today’s the day I and many others, with or without direct military experience, take some time to remember all those who made the ultimate sacrifice for their country since the First World War. Some of my buddies in a requisitioned trawler in the South Atlantic during the Falklands War. We were cross-decking from the QE2 to warships to make our journey into San Carlos Water, or ‘Bomb Alley’ as it was known. From the warships we boarded landing craft to make the final stage of our journey ashore. In case you’re wondering, refreshments are not served in landing craft. Pride in one’s nation and the idea that a nation can or should have an identity at all have become contentious concepts in recent years. Setting that contention to one side for a moment, the fact is that the United Kingdom as we know it today – with its freedom-loving and, yes, predominantly tolerant citizens – is the way it is as much as anything because so many British people, along with our allies, gave their lives in conflict so that we may enjoy our lives as we do today. Life is so precious, and a life lived in freedom is especially sweet, don’t we know. There is nothing in the least bit glorious about warfare, but there can be a just cause. With everything that’s going on in our country today, now more than ever we need to find common cause. For me, that common cause should be for us Brits to be thankful that we can if we want, despite everything, muddle through inelegantly without resorting to civil war. Let’s use our freedom in all its forms, of speech, of the press and of association to forge a peaceful future for our children. Make your points to your friends: be civil; be polite; listen; but, whatever you do, keep your friendship. To all those who served before me, and with me, and since, and who gave their lives so that I and my family and friends are free today, thank you so much. Rachel Bostock’s rendition of ‘The Last Post’ is exquisite. I didn’t realise you were a ‘Bootneck’ MM. Did you ever come across Maj Bill Peart RM?. 35 years ago, he was OC 2 Raiding Sqn stationed at HMS Tamar in Hong Kong. He served 25 years or so in the RM and was a contemporary of mine at school, (best pal, and still is). We are in regular contact, and me and my good lady re-visited Hong Kong last month to commemorate our 35th wedding anniversary, having spent our honeymoon in HK staying with Bill and his wife in married quarters up on the Peak. Robert E Lee. Sqn Ldr RAF (ret’d). Not a Bootneck, Bob: a Rockape (RAF Regiment). These days the RAF Regiment gets lumped in with the Royal Marines and the Parachute Regiment supplying troops to the Special Forces Support Group. We (the RAF Regiment) were surprised in 1982 to find ourselves part of an amphibious expeditionary force, but then so did pretty much every other British serviceman of the line! Especially since my unit was based in Germany at the time and we were supposed to be squaring up to the Russians. 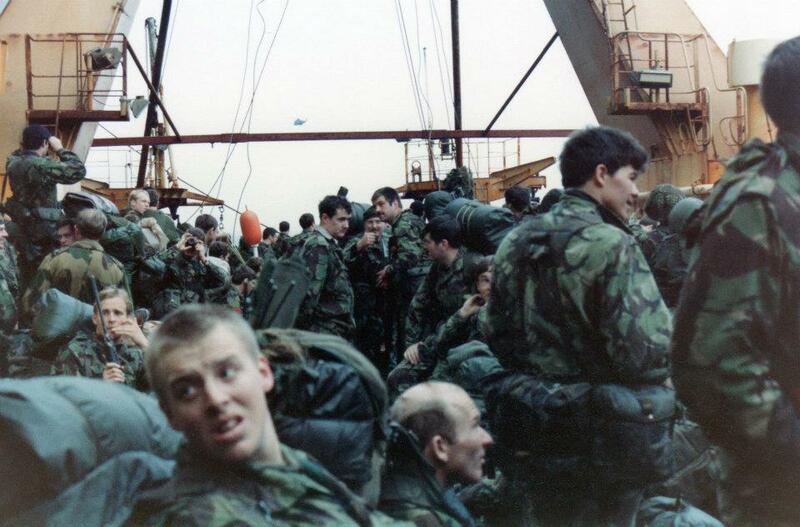 I never did anticipate that my first major military operation (I’d done several tours in Northern Ireland before the Falklands War) would involve me going into battle in a landing craft, but life’s never all that predictable in the armed forces, as you know. Thinking of Terry who lost his eyesight. Well said. This is the first one without my father who served in the Malayan Campaign. He is greatly missed. As always Moraymint you have hit the nail on the head and I echo your thoughts “we will remember them”. Thank you Moraymint for your timely reminder, the last sentence sums it all up for me. modest achievements (RM 1938-52) so I have some hope for the future even after our disagreements regarding the EU!